TWO FABULOUS BLOGGERS closed down the Deadly Friendship blog tour yesterday (Sunday 30 July) exactly one week after the third book in my DI Hamilton series was published by Bloodhound Books. But, it wasn't just two outstanding bloggers I had on the tour - no, I was very lucky to have seventeen in total. Today, I felt like I needed to take a step back from working, reading and entertaining my little boy to say a massive thank you to each and every one of them. It's sad times when you read various social media threads or other blog posts downplaying and being downright rude about the work bloggers do for us authors. For the sheer love of books, they spend their free time reading our work - many times in advance and up against a tight schedule - and then, if they've enjoyed it, they'll spread the word to other bloggers and readers; far and wide beyond your expectations. They schedule blog posts, tweet and retweet, post and share on Facebook and some even take to Instagram to shout about a book they've read. In the past, I've also discovered that even if a blogger didn't particular like my book, or parts of it, they are constructive and compassionate with their feedback. They appreciate the time and sweat (and sometimes tears) that can go into writing a book and I've never come across a blogger who wasn't honest - even if it wasn't exactly what you wanted to hear. 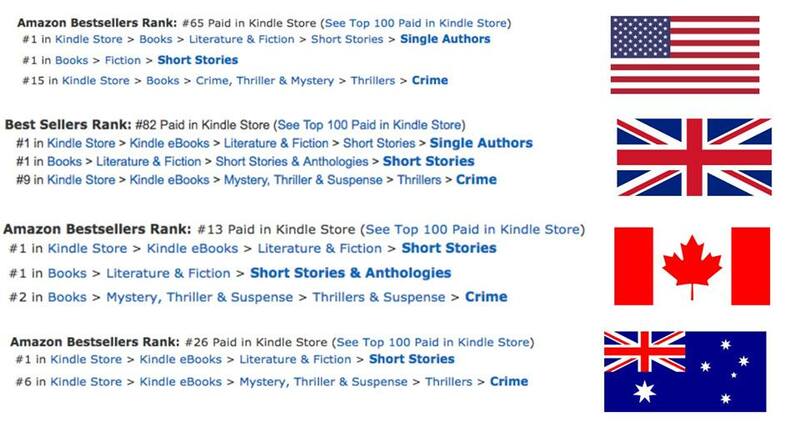 But, I'm here to celebrate and thank some very special people who, over the last week, have shared and shouted about Deadly Friendship, left reviews and encouraged readers to buy my book, and series. So, a huge thanks to Little Miss No Sleep, The Crime Warp, Best Crime Books and More, Jessicamap Reviews, eBook Nerd Reviews, By The Letter Book Reviews, Sean's Book Reviews, My Chestnut Reading Tree, Between the Pages Book Club, Booksormer, The Haphazardous Hippo, Bibliophile Book Club, Novelgossip, Crime Book Junkie (who offered up a double whammy of a review), Damppebbles and Bits About Books. 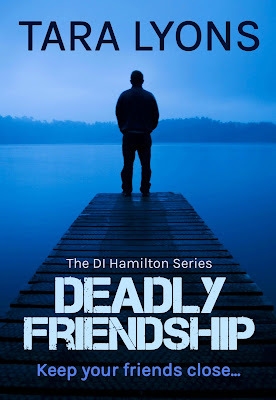 I must also send an extra thanks to Chelle's Book Reviews who couldn't be on the blog tour, but kicked everything off with a fab cover reveal for Deadly Friendship. You guys rock. And lastly, there's no way I could hit publish on this post without thanking a very special member of the Bloodhound Books team, Publicist Sarah Hardy, who makes all this happen. From sending the ARCs, to sharing posts and creating stunning posters and imagery. 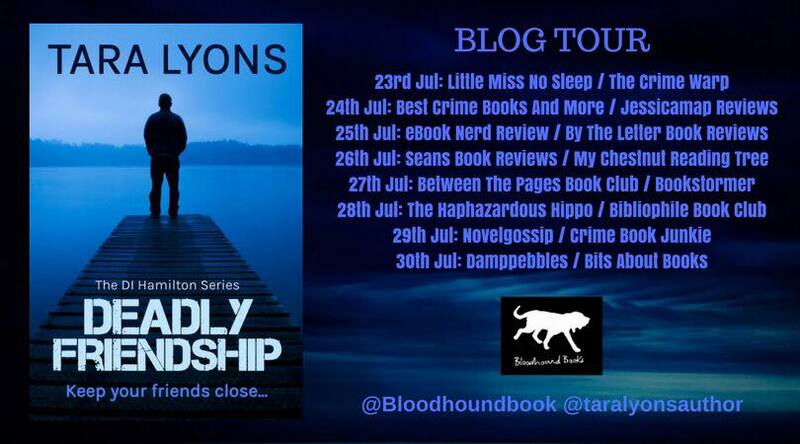 Thank you for making the blog tour for Deadly Friendship happen and run so smoothly. I must apologise for the radio silence of late on this blog - it's been quite a hectic few months. My son is preparing to leave part-time nursery and enter the world of full time education in September, we had a very spontaneous week away in the sun and my third book has been signed off and ready for publication. I'm very excited. 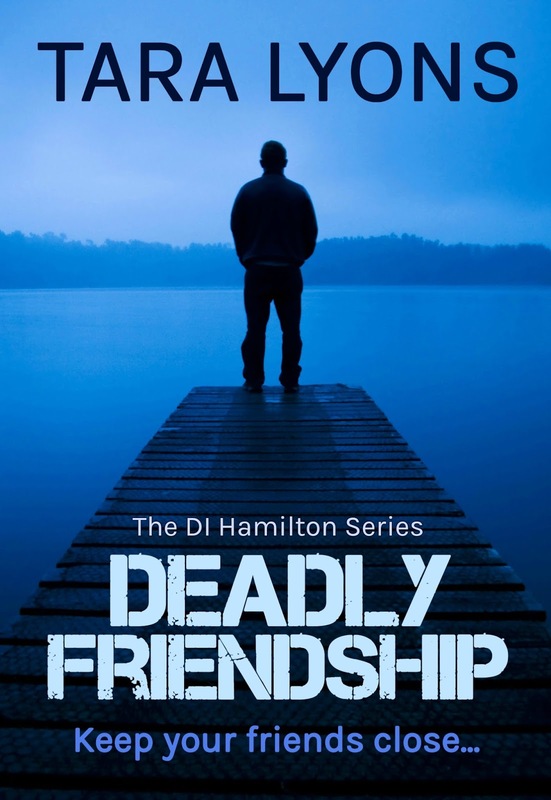 Deadly Friendship is the third book in the DI Hamilton series but, as with the other two, can easily be read as a standalone. I'm delighted to tell you it will be published this Sunday ... yes, THIS Sunday, by Bloodhound Books. Detective Inspector Denis Hamilton is dragged into a gruesome murder investigation, while on annual leave at Lake Windermere. A handwritten note, with a woman's name, is found inside the corpse. When a direct link to London is identified, Hamilton must race against the clock to make the connection before the body count rises. Then, when a person from Hamilton's past returns, he must ask himself: how well do we really know our friends? London's murder investigations team returns in this third novel from the bestselling author of In The Shadows and No Safe Home. Advanced readers have said they've been "gobsmacked," "guessing right up until the end," and "literally had no idea what was going to happen." What better way to enjoy a bank holiday than with a free book? Even if you're not a UK resident, you can still take advantage of the offer and grab a copy of In The Shadows for free, but only today, Monday 1 May 2017. In The Shadows, the first book in the DI Hamilton series, asks: How far would you go to uncover the truth? Would you venture into the shadows to unmask a killer? Click here to head off to Amazon and take advantage of today's freebie. I do hope you enjoy it! So, today – Tuesday 18th April – marks the end of the Easter holidays and my son returns to pre-school. Although I’ve just written the date, I have no real clue what day it is, why I’m sitting at my laptop and who the characters in my work in progress are. You see, I think I’m a very lucky person to be able to work from home. It means a can choose the hours that suit me and I can work around my son’s part-time school rota. However, the downside to that is, I’ve found I’ve just had two weeks off work… two weeks I didn’t actually want off, and I’m feeling extremely guilty. Before my son finished nursery, I had just hit the half-way mark with my work in progress. My protagonist, DI Hamilton, was talking to me and telling me where he wanted the story to go and another influential character was coming up against some deadly threats. I was in a good place with the story. I’m usually quite good at getting the work/life balance right and if I can’t work during the day, I’ll write at night after my son has gone to bed. However, it seems the Easter holidays have run away with me; busy all day with various activities and outings and visiting family/friends. So, even by the evenings, I was shattered to the point where I’ve felt no brain power for creativity. Having less time to write, I thought it can’t all be bad because it’ll mean I’ll get loads of reading done, which can sometimes be just as useful. Sadly no, I managed to finish only one book, and the other one I started last week, I’ve only reached 30%. On a positive note, I did spend one whole day writing. I managed to get just under 5,000 words written in those few hours. Now, none of it has been edited, so I’m hoping it reads as well as I think I’ve written it. Plus, I’ve made notes galore – in notebooks, as well as on my phone – that I can comb through now I’m back to “normal” and make the necessary changes that have come to mind mid-mini golf or feeding at the farm. There is also another positivity that’s come from the Easter holidays – the break freed my mind and actually gave me some space from my work in progress. It meant I had the chance to think of other story ideas I’ve been wanting to focus on, and I now have the foundations for my first standalone book, which I’ll concentrate on next year. It’s been something I’ve wanted to start for a while, but only had the smallest niggle of an idea – well, I now have the premise of the story and the protagonist is clear in my mind. 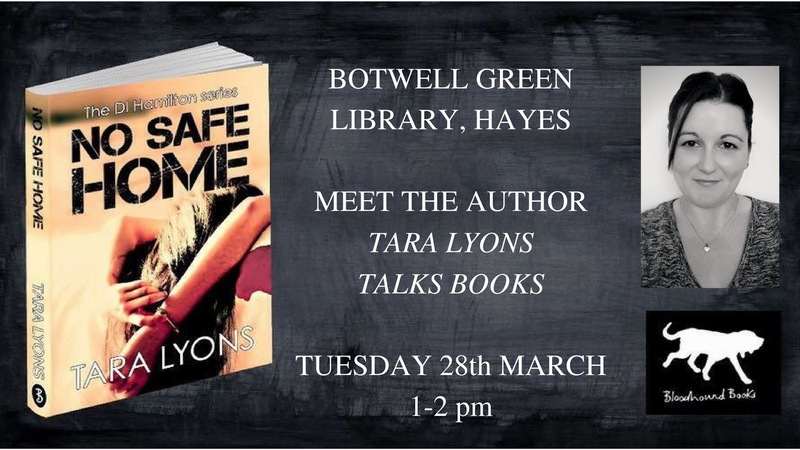 As it's World Book Day, I thought this would be a fantastic opportunity to share with you that I have been invited to Botwell Green Library this month. 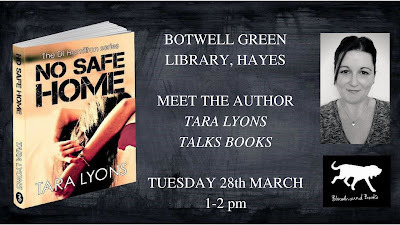 The library, in Hayes, regularly holds an afternoon tea event with authors and I'm honoured to have been booked in for Tuesday 28th March, 1-2pm. Although Hayes is not local to where I live, it is local to where I attended Brunel University. So, I'm really excited to be travelling back there and meeting up with fellow book lovers. This is the first time I'll be involved in an author chat, and I'll admit, I'm rather nervous about the prospect. However, I'm trying to keep in my mind that those who attend, are there because they're interested in crime fiction, reading in general, or even me. And, if no one turns up, then it'll be an experience - and I promise to report back to you all. If you're near Hayes, and it sounds like something you'd fancy, please feel free to come along. I'll also have a few paperback copies of No Safe Home to sell and sign. Huge thanks to Bloodhound Books for making this event possible. Fingers crossed for me. 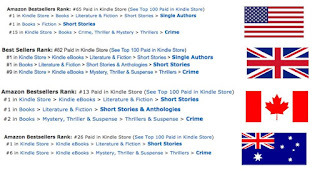 I am delighted to share that this week, Dark Minds: a charity collection of short stories from some of your favourite authors, entered Amazon's Top 100 chart in four countries. The book, which is available in eBook, paperback and audiobook formats, was published by Bloodhound Books in December 2016. 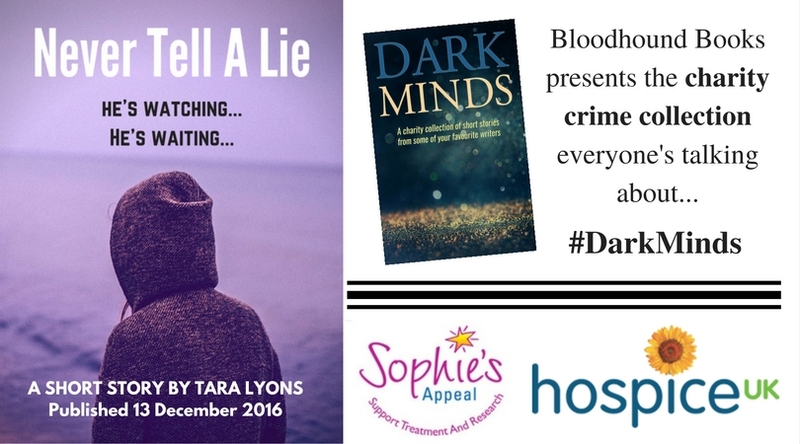 All the profits from the sale of this book is donated to Hospice UK and Sophie's Appeal. Dark Minds is a collection of 40 crime and thriller short stories by authors including Steven Dunne, L.J Ross, Lisa Hall, Betsy Reavley, M.A Comley and myself. We came together to produce an anthology that will lure, tantalise and shock its readers. My short story, Never Tell A Lie, was a great way to try something new. I stepped away from Detective Inspector Denis Hamilton and entered the mind of villain. Below is the first 500 words of the story to whet your appetite. At the time of posting this blog, Dark Minds kindle edition is on special offer for just 99p/99c - yes, that's right, less than £1 for 40 short stories. If you'd like to find out more, click here to visit Amazon. It was during the winter of 2015 I became a real man. The frost welcomed me every morning and I hid behind a large oak tree in Roundwood Park. The grass crunched under my feet as I hopped from side to side, waiting from 5am. Fiona wouldn’t jog by for another hour, but I never wanted to miss her. The black, tight leggings showcased her beautifully long legs and toned arse. I wanted to rip the jumper from her chest, fully expose the bouncing cleavage it masked. I’d waited so long. My tense body was like a mountain of frustration until she ran by. I’d grow hard as I yearned to touch her. She was my release and I needed to see her every day. Except on a Sunday; Fiona didn’t run on Sundays and I went to church. I had met Fiona a month earlier at the coffee shop, and instantly wanted her. Her hair shone like the sun and her blue eyes enticed me, pulling me in like the waves of the ocean. I served her a large latte to-go every day for a week before I summoned the courage to ask her out. She swiftly held up her hand and pointed to the gleaming diamond. ‘I’m married, sweetie. Thanks for the compliment.’ She laughed and left the café. I’d never been turned down before. My teeth clenched together in anger. I was used to getting what I wanted – as a handsome man with a great sense of humour, it was what I expected. Her rejection was like a punch to the gut. But, the more I thought about her, the more I wanted her. She was playing hard to get and that was new. That was exciting. For another week I watched Fiona’s every move. I followed her on Monday morning, after she’d collected her usual beverage; disappointment hit me when she didn’t notice I wasn’t serving. She seemed to breeze through life with such dignity. My respect for her grew; Fiona was the type of woman I could see myself starting a family with. I had waited so long to find the right woman – the kind of woman my father had spoken about when I was a boy. The week turned into a month and soon I knew everything there was to know about Fiona. Her daily exercise routine, where she lived and worked, which shops she frequented and the journey she took home. She was so busy with her daily tasks, or always with her nose stuck in a book while travelling, she barely took notice of anyone around her. Never once did she notice me watching her. To read the rest of this short story, and many more, click here to visit Amazon and grab your copy. I'm delighted to reveal the cover for the second book in The DI Hamilton series, No Safe Home. The book will be published by Bloodhound Books on 31st January 2017.